KANSAS CITY, Mo. – Redshirt-junior Dedric Lawson accounted for 16 of the Jayhawks’ final 19 points to help No. 2 Kansas outlast the New Mexico State Aggies, 63-60, Saturday night inside Sprint Center. Kansas trailed by as many as seven points in the second half before Lawson closed strong and tallied his fifth double-double of the year. With the victory, the Jayhawks moved to 8-0 for the first time since 2010-11 and remained one of 10 teams still undefeated on the season. Meanwhile, the Aggies dropped their second game of the season, moving to 7-2 in 2018-19. 11 of their 32 tries from the field and posted a season-low 26 points in the first frame. The Aggies took advantage and, after KU took an early 12-2 lead, the visitors outscored the Jayhawks 26-14 over the final 16 minutes prior to the intermission. This run handed KU their fourth halftime deficit of the year, 28-26. New Mexico State carried that momentum into the second half. Over a six-minute span early in the frame, the Aggies hit 8-of-9 shots, including a 4-of-4 mark from 3-point range, to help build a 51-44 advantage with just over 11 minutes remaining. From that point forward though, it was all Lawson. 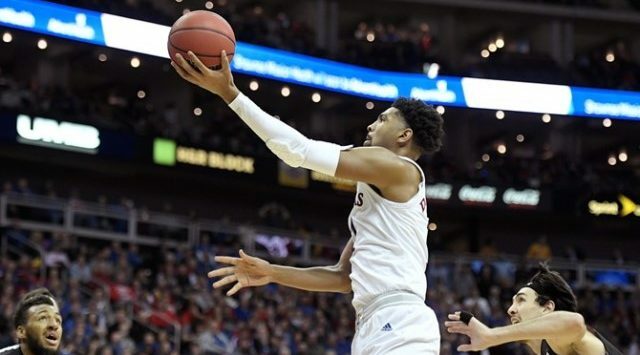 The 6-9 forward kicked off a stretch that pulled his team back into the game, scoring 11-straight points and handing KU a 60-57 lead with a 3-pointer at the 3:23 mark. Kansas held off the upset-minded Aggies from there, holding NMSU to just one field goal in the final minutes. Kansas finished with only two scorers in double figures, Lawson (20) and sophomore Marcus Garrett (10), but had eight of the nine players who entered the contest put points on the board. Lawson also tallied his fifth double-double of the season after finishing with a team-best 10 rebounds on the night. Defensively the Jayhawks held the streaky Aggies to a mere 60 points despite them coming in averaging 81 per game. This came in large part to their defense of the three-point line, holding New Mexico State to 26.9 percent (7-26) shooting from behind the arc. The Jayhawks also turned 16 Aggie turnovers into 29 points on the night.